Peak 41 received its first official ascent in 2002 when a Slovenian Party summited via a route up the South Face. The more remote and complex North Face, accessed by a further two days walk into the Hongu Valley, had never previously been attempted. This expedition chose to attempt a couloir up the North Face, this being both the obvious line and most free from objective danger. After two days of climbing up bad snow and extremely poor rock the party reached a point just under 6000m before abandoning the line. Due to time constraints a second attempt could not be made. 8 years Alpine experience including the North Faces of the Eiger, Matterhorn, and Grande Jorasses. 10 years Scottish Winter experience up to Grade VII. 10 years UK Trad experience up to E6. 10 years Alpine experience including the North Faces of the Eiger, Matterhorn, Droites, Courtes, and Verte. 15 years Scottish Winter experience up to Grade VIII. 18 years UK Trad experience up to E8/9. After many years of apprenticeship in Scottish Winter and the Alps the time seemed right to organise an expedition to the Himalayas. My regular climbing partner – Jack Geldard – felt the same way, and having climbed the North Faces of both the Eiger and Matterhorn together felt like we would be a good team. 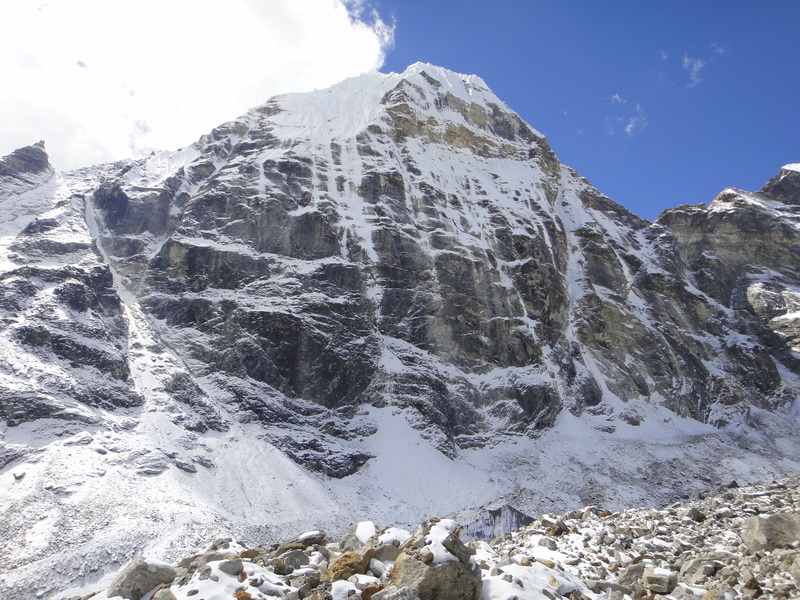 Initially we sought advice from friend/mountaineer Andy Houseman, who mentioned that he was planning an expedition to the Hongu Valley, Nepal the following year to attempt a new route on Chamlang. Being that there was a lot of other good looking mountains in the valley he asked if we would like to share the same base-camp and attempt one of the other lines nearby – it was the perfect opportunity and we accepted the invitation immediately. After inspecting maps of the valley, Google Earth, and images acquired online we settled on an objective that looked worthy of attention – the North Face of Peak 41. We wished to attempt the face in good/clean alpine style without fixing ropes or use of supplementary oxygen. It looked ambitious, but a good ‘technical’ objective that suited our strengths. We flew to Nepal on 30th September (via Delhi) with Jet Airlines. Just a few days later we received our permits from the Ministry of Tourism and met our LO (who we did not meet again until the end of our expedition). Unfortunately the weather was cloudy in the mountains and we had to wait for flights to be resumed to Lukla. This proved easier said than done as two days later we were still waiting and nice though the Kathmandu Domestic Airport we were eager to approach the Hongu and being acclimitising. Fortunately our Agent – Loben Sherpa – did a fantastic job and managed to get Jack and myself on the first available flight, our bags on another, and Nick and Andy on helicopter. In Lukla, our Sirdar (Buddhi) and Porter Guide (Karma) had already hired 12 porters and we were ready to go that same day. We decided to approach the Hongu Valley via the Zatra La – Kote – Tagnag – Khare – Mera La route. We scheduled in two shorter days to allow for gentle acclimatization (Zatra La is a somewhat brutal introduction!) and allow for both us and the porters to rest in Khare before the Mera La. We experienced good weather throughout the walk-in and a smooth journey across the Mera La. Upon arrival in the Hongu Valley it was easy to see where to pitch BC (4800m), being that there was a perfect flat spot directly beneath both Peak 41 (for us) and Chamlang (for Andy/Nick). The only downside – we realised several days later – was that this area seemed to attract the wind / cold weather. A mere 500m up the valley you could be in shorts and t-shirt whilst everyone else at BC was in down jacket/thermal underwear! The upshot was that it’s location was perfect and without much further ado we began acclimatising. Our first outing was up an attractive ridge just opposite Nick + Andy’s objective Chamlang, being around AD and reaching a height of 5500m it was a perfect start to the trip. After a days rest we then began a more substantial undertaking by heading up to the West Col of Baruntse (6200m), this took one day to reach BC and another to reach West Col where we slept overnight. Upon our retreat from the face it took four (long) days to reach Lukla, the first of which was possibly a little too long – particularly for the porters. Without a shadow of doubt the rock in this valley is the worst I have ever encountered. Being that we are both loose-rock enthusiasts and that Jack has climbed E8 on Craig Doris (perhaps the loosest cliff in North Wales) I felt like this was a valid assessment. Everything disintegrated when you placed a peg and fell apart with wires/camming devices. The stable weather meant that much of the snow hadn’t consolidated throughout the valley with a thick crust + large areas of windslab evident all over. Where there was ice it was good, but extremely hard as a result of the consistently cold temperature. Consistently cold. Some days it would not reach higher than 0c at BC and it would drop to -10/15 overnight. That said, it was by and large clear and bright with very little snow-fall throughout our stay. Peak 41 seemed to have a unique weather pattern in that it’s summit would be enveloped by cloud in the middle of the afternoon almost every day. There was a constant plume of snow coming off Peak 41/Chamlang indicating wind that could not be felt in the valley. After two days rest we were ready to attempt our line on Peak 41. Having spent many hours examining the face we had established the most plausible line and set that as our target, many others existed but these either ranked as ‘futuristic’ or ‘suicidal’. Both of us wanted to get back alive and being that this was our first Himalayan Expedtition didn’t want to do anything out of the ordinary! At 4:00am we left BC heading for the face, as was expected everything took a little longer than ususal: something that would have taken an hour in Scotland/the Alps took two, something that should have taken half a day took a whole one. Arriving at the base of the couloir we discovered that snow conditions were exceptionally poor with a thick/hard crust of windslab covering everything – caution needed to be exercised. I couldn’t say that conditions improved as height was gained, they just changed. After around 500m (vertical) the windslab was replaced with a substantial amount of unconsolidated/sugary snow, this meant for quite easy yet very tenuous climbing (think Point 5 Gully on a bad day). Progress was difficult to make at speed and the ridge we were aiming for seemed to take, onceagain, at eternity to reach. When finally doing so we opted to pitch the tent there and then as it was a good/safe spot and were unsure of what lay ahead (looking back this was the right decision), furthermore we had a stunning view of Chamlang, Makalu, and Everest. Even in the cold weather and general apprehension of what was to follow it was hard not to be blown away by the beauty of what surrounded us. The following day we woke up, brewed up, and packed up aiming for the ridge above that would connect us to the summit (eventually). After more time consuming and increasingly dangerous climbing, with sugary snow becoming so thin my pick placements were going through to shale, I reached the ridge (<6000m) and looked up. My heart sank – it was like a Jenga puzzle of breeze blocks and shale… It seemed like the same stable / cold weather that had allowed us to have a window whenever we desired had scuppered our chances via other means – there wasn’t enough snow and where there was it wasn’t of a good enough quality. Had I have continued up I would have invariably killed Jack who was simul-climbing up below the ridge line. It was time to leave. Game Over. The only problem remained was finding equipment good enough to abseil off and the best I could find was a Bulldog hammered into the shale like a makeshift grappling hook. Back at the bivi site we considered alternatives, there was the possibility of a line further right but this looked even harder and with one less day in terms of time/food/fuel the decision was made to retreat. For a more colloquial report on our experiences please visit http://jackgeldard.com and http://robgreenwoodclimbing.com. All waste (inc. gas canisters) were carried to Lukla Garbage Disposal. Because we attempted the route in alpine style no fixed ropes/camps were left on the mountain.